Cannabis has been used for medicinal purposes for thousands of years in Asian and Middle Eastern countries. The medicinal use of cannabis in Europe and North America has declined during the 20th Century largely due to the lack of standardized preparations (1). The tide has turned. In the near future Britain should become the first country to license a cannabis-based pharmaceutical (2).The principal active ingredients responsible for the efficacy of cannabis are phytocannabinoids, a family of over sixty 21-carbon terpenophenolic compounds that are unique to cannabis. Sativex®, the first UK cannabis-based medicine contains two from this family - Tetrahydrocannabinol (THC) and Cannabidiol (CBD). THC is the principal psychoactive ingredient in recreational cannabis. CBD is not psychoactive but both cannabinoids have profound medicinal properties. The phytocannabinoids have close similarities to the endocannabinoids, a family of amidated lipids found widely throughout the animal kingdom. The endocannabinoids and phytocannabinoids interact with the cell membrane CB1 and CB2 receptors within the body. Our understanding of how these cannabinoids and receptors interact is growing (3), however why the cannabis plant produces the cannabinoids remains a mystery. This article briefly describes how and where the cannabis plant produces the cannabinoids, and highlights some of the production methods that guarantee regular year-round harvests of uniform high quality cannabis plants. The swollen structure is commonly called a glandular head. This secretion contains predominantly a mixture of cannabinoids but also a range of essential oils including myrcene, limonene, caryophylenes and many others. These oils are widely found in other plant species where their unpleasant taste has been proved to have insect repellent properties. With the commencement of flowering the capitate-stalked trichomes appear. 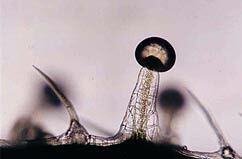 Like the sessile type, these also have a glandular head containing secretory cells and a secretory cavity. Capitate-stalked trichomes are only found on the bracts that surround the flowers and seed, and they occur in a much greater density than the sessile type (see Figure 3-5). The pubescence of glandular trichomes gives the female cannabis inflorescence a glistening white appearance - this is clearly shown in Figure 7. In addition to cooling the cannabis flowers, by reflecting the radiant heat of the midday sun, the sticky trichomes are an obvious barrier to the passage of insect pests. Synonymous with the 'hippy image', the cannabis leaf has adorned clothing, posters and rock albums for decades. 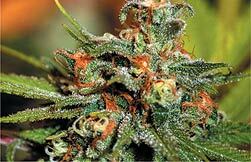 It is surprising therefore for many of us to learn that the leaf contains very little psychoactive drug at all. Although the cannabis leaves do carry cannabis trichomes, the number is rarely sufficient to raise THC levels above one per cent by dry weight - the average content of the psychoactive ingredient THC in street cannabis varies widely but averages four to five per cent (8). The female flowers are the densest source of trichomes and also the richest source of cannabinoids. Grown in the absence of pollen, female cannabis plants continue to produce trichome-rich flowers in the forlorn hope of achieving fertilisation. If the female plant was allowed to set seeds, trichome and cannabinoid production would be reduced greatly. Potent female cannabis plants, raised in the absence of males, can reliably produce dry floral material containing 15 per cent THC or more; well-processed material can contain in excess of 25 per cent THC. Most medicinal plant species are grown outdoors, and indeed updated working party guidelines were recently issued describing how medicinal plants should be grown to good agricultural practice (GAP) standards (9). However due to the vagaries of the climate, the lack of security and other shortcomings, the outdoor-growing of cannabis is unsuitable in Northern Europe and a well-equipped glasshouse or indoor growth-room remains the better option. To meet the pharmaceutical industry's demand for safety, quality and efficacy, the grower's principal aim is the production of uniform crops within a tight specification. To achieve this our approach has been to maintain close control over a large number of variables listed below (10). Temperature and day length need to be closely controlled. The greatest challenge is the provision of sufficient light energy throughout the year. Growing medicinal cannabis within the UK necessitates massive investment in electric lamp fittings. Over the course of the year, more than half of the light energy consumed within the glasshouse is from the lamps. Figure 6 shows a crop of medicinal cannabis growing under such conditions. Being generally a 'short day length' plant, outdoor-grown cannabis flowers naturally in late summer. Grown in a glasshouse under bright lamps however, the day length can be manipulated to prevent or induce flowering. By controlling the duration of vegetative growth before the induction of flowering, the size of the plant is tailored to ensure the optimum quantity of foliage per unit area. Good agricultural practice allows the judicious use of pesticides, however we have avoided their use so far. Maintaining scrupulously clean growing areas along with tightly controlling the growth conditions and work patterns minimises pest and disease spread. Where mites and insect pests do occur, an arsenal of biological control systems are utilised. 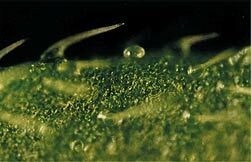 Trichome formation and cannabinoid biosynthesis slows towards the end of the plant's life. The colour of the trichome gives a strong indication of the state of maturity of the plant and the cannabinoid content. Immature trichomes are crystal clear but these turn a milky white when fully mature. Over-ripe trichomes are a distinct brown. In a less well-controlled growing environment, knowledgeable cannabis growers would need to monitor their crop regularly. Harvest would take place when visual inspection indicated that the time was right. In the tightly controlled growing conditions of the pharmaceutical company crop however, the harvest date is confidently placed in the diary the very day the crop is planted. The ability to grow uniform crops enables harvest dates to be timetabled well in advance. Long delays in harvest are not tolerable as newly rooted cuttings urgently await the glasshouse space. Throughout the plant world, many of the secondary compounds produced in trichomes are in fact toxic to the plant that produces them. In such cases, it is only by secreting the product away from the leaf mesophyll tissue that the plant can produce high concentrations of secondary metabolites while avoiding self-harm. This is indeed true for cannabis. 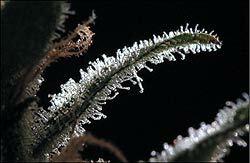 The quantity of terpenoids stored in cannabis trichomes would be toxic to unprotected leaf and flower tissue. The remarkable efficiency of cannabis trichomes means that a dry botanical raw material can be produced containing at least 25 per cent secondary metabolites. Very few plant species can exceed this. Cannabis grown outdoors in favourable conditions can produce an annual secondary metabolite harvest of over one tonne per hectare. Of this, at least two thirds will be cannabinoids, the remainder being essential oils. Compare this to 38kg per hectare of Artemisinin from Artemesia annua (11) and 140kg per hectare of morphine from Papaver somniferum (12). 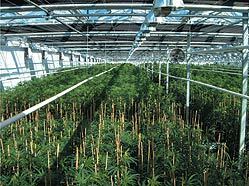 By growing repeat crops of cannabis in well-equipped and carefully controlled glasshouses, this species can produce in excess of 36 tonnes per hectare of dry botanical raw material per year. Twenty five per cent of this material would be cannabinoids and essential oils. That equates to an annual yield of secondary metabolites of nine tonnes per hectare. Cannabis does not just produce some of the most valuable natural products to man; when ranked for its performance as a producer of secondary metabolites, cannabis is a league leader.